Today, I wanted to take a closer look at what some of us might consider a commonly understood topic – The Word of God. By a show of hands, how many of us know what the Word of God is? What is the Word of God? It is IMPOSSIBLE for ANY HUMAN MIND to exhaust ONE TRUTH OR PROMISE! Now keep that thought in your mind as we go through this study, because that is a vitally important aspect for us to understand! This is a good principle for us to understand – That God illustrates what the end will be like by showing what the beginning is like. So if we want to understand what the Word of God constitutes here at the end of time – we should first investigate what is revealed about it in the beginning. Did you notice what happened when God opened His mouth and spoke the first words – light appeared! Whenever the Word of God comes on the scene – light comes with it. You cannot have the Word of God, without having light with it. But also notice that with the presence of Light, you now have, in contrast, the opposite of Light – darkness – which is nothing but a lack or absence of light. But darkness is only revealed as such by the presence of light. Did everyone understand what I just said? Let me explain it in a different way. If I had been born and raised in the dark recesses of a cave, darkness would be the only thing I ever knew. I would not understand what it would mean to be able to “see” “light”. But if one day, part of the ceiling fell in and let a beam of sunshine down into the cave – immediately, I would gain some knowledge of light, and there would be an immediate formation of two distinct classes – light on one hand and darkness on the other. Now notice that here in Genesis 1:3 the earth was full of darkness, but with the entrance of the Word of God – two classes are formed and in verse 4 – God immediately separates them. So you have darkness, which is the absence of light – then the Word of God brings light into the equation and immediately you have a separation take place – separating the light from the darkness. I know this might sound a little elementary – but I really want us to take a moment and think about the spiritual ramifications of this. The Word of God is light, and light brings about a separation from darkness. Do we see somewhere else, you know, a second witness, that the Word of God defines this principle? So what is the light? It’s His Word. Notice that this verse even adds some more definition to the word “light”. What is light? So now with that understanding of “the Word of God” and “light”, let’s look at another text. So here we see that the Word of God was here at the beginning and that the Word of God is the Creator. We also see that the Word of God is referred to with a personal pronoun - “him”. John 1:6-13 There was a man sent from God, whose name was John. The same came for a witness, to bear witness of the Light, that all men through him might believe. He was not that Light, but was sent to bear witness of that Light. That was the true Light, which lighteth every man that cometh into the world. He was in the world, and the world was made by him, and the world knew him not. He came unto his own, and his own received him not. But as many as received him, to them gave he power to become the sons of God, even to them that believe on his name: Which were born, not of blood, nor of the will of the flesh, nor of the will of man, but of God. So here we see that John the Baptist came to bear witness to “the Light” – and only those who receive Him can become the sons of God – Only those who receive the Light can become sons of God. Did you catch that? First – Who is this talking about? Jesus Christ! Now just let that thought soak into your mind a minute. The Word of God was made flesh! Jesus Christ is the embodiment of the Word! This is something that I don’t think many people today grasp. I know I didn’t. When the Holy Spirit first impressed this thought to my mind – it literally moved me to tears. When you hold in your hand, the Bible, you are holding Jesus Christ! 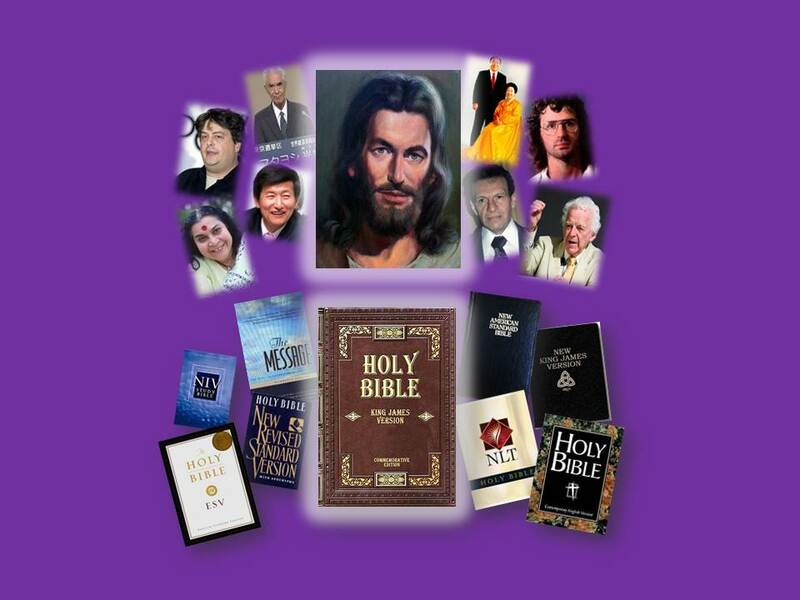 Now I’m not talking about some mystical spiritualistic magical idea, like what Catholics believe about the mass or anything - that is Satan’s counterfeit – What I am saying is that this book, the Bible, is the perfect revelation of Jesus Christ. When you read a text in the Bible, you are reading words spoken directly to you by the Creator himself. Words that describe the very life of Christ. Now this is not something that I can express in words. This is something that the Holy Spirit will have to impress upon you as you study for yourself. I find that human words fail to grasp the eternity of this thought. It is one of those boundless, shoreless sea, experiences! Now one reason why the Bible, the Word, being incarnate as Jesus Christ, is so vitally important for us to realize and understand, is because of all the attacks that were made on Christ when he was here, and how they are paralleling the attacks, both subtle and blatant, on the “Word” today. One of the thought processes that is engrained into Adventism, and Protestantism in general, today, is the idea that not all of the Bible is inspired equally. The Jews had this same idea with Christ when He was here. The scholars like to break the Bible down into what they term “genres” (zhahn-ruhz) which are the different literature styles used in the Bible. These range from songs and poetry to historical narratives to visions and prophecy. Some of the books of the Bible that most scholars believe are almost total poetry are the books of Job, Psalms, Proverbs, Song of Soloman and Lamentations. I have actually had scholars tell me that certain texts don’t contain prophecy because they are poetic not prophetic. This is actually a very dangerous position to hold for it totally removes your ability to correctly understand scripture. But let’s look at this claim, is it true? Turn in your Bibles to what the scholars refer to as one of the poetic books – the book of Psalms. Now we see from the first phrase that this is a song – not only is it written to a musician, but it is written as a psalm. And we can sort of guess that it is poetic because all good songs are written with some form of poetry. So do you think that the book of Psalms is just poetry? It is obvious that Psalms is not only songs and poetry, but it is also prophetic! This is only one example, but the whole book of Psalms is prophetic. As you study it out, you will discover that God impressed David to write the book of Psalms for the purpose of not only revealing the future to, but also as encouragement for, God himself, Jesus Christ, when He would live as a man upon earth. Not only that, but for the same reasons, for us, because we, at the close of this earth’s history, are repeating parallel events that were shown in the life of Christ. How many of you have ever wondered why Christ always seemed to know everything in advance? He recognized who He was – even in childhood, long before the voice from heaven at His baptism. He always seemed to know the events that would happen in His life. He even could recognize when it was time for His death. How? After all, He was God! Doesn’t God know the end from the beginning? Was Christ endowed with special powers to know the end from the beginning? No! We are told that Christ didn’t have anything that we can’t have! He wouldn’t even use His divine power, because He could not use anything that we can’t. How do we know that Christ didn’t have supernatural power, of His own, to see into the future? So how did He have this kind of future knowledge? It is because He studied the Word of God! The scriptures revealed to Him all the events and timing of His life. And because of His close connection with the Father, He could understand just where He was in the stream of time. And you know what else? This tells me that if we have that kind of close connection with the Father, and prayerfully study the Word, then we will have the same kind of foreknowledge of the future events that Christ had. Now I just talked about Psalms, but all the books of the Bible are like that. In Proverbs 30 it even refers to prophecy. And then it gives a description of Laodicea, for example verse 12 says, “There is a generation that are pure in their own eyes, and yet is not washed from their filthiness.” Sounds like those who are rich and increased with goods and have need of nothing to me. The book of Job is an awesome description of the 144,000 here at the end of the world. The book of Song of Solomon is just as prophetic as the book of Daniel. Solomon, son of David – his name means “Prince of Peace”. The book is the story of the courtship of Christ, “The Prince of Peace” , and his wife – the woman – the church. Now of course, the scholars always comfort the common people with the assurance that even if you don’t know Greek and Hebrew, never fear, you can rely on the writings of the scholars to teach you the correct understanding of the Bible. This mindset, is extremely dangerous, because it effectively takes the scriptures out of the hands of the common man and puts the interpretation of them into the control of the scholars. This mindset is nothing but Papal dogma that has been incorporated into the Protestant churches today. Question: How many Jewish scholars didn’t understand the true character & mission of Christ when He was here on earth? Most of them! How many of those same scholars had a correct understanding of Greek and Hebrew? Most of them! How many had a correct understanding of their culture? I would venture to guess – All of them! How many here understand what the words mean in this sentence? Do you understand the English language? Do you understand this culture? Yes! How many of you understand what the sentence itself means? All of you! Now, how many understand what I mean, when I ask this question? Only 1 person! My Wife! Why? Because there is an intimate connection between the two of us! Only my wife understands that question in the way that I mean for it to be understood - You see, that question is how I started my proposal. This is how it is with the Bible! You have to have a close connection with its Author, and be listening to the Holy Spirit – in order to correctly understand it! In other words, the Jewish scholars understood the words that He spoke because it was in their language, but they failed to understand what His character or mission were because He spoke in figures and symbols, and they didn’t have that intimate connection with Him – and because of their lack of understanding – they rejected and crucified Him! With that being the case, do you honestly think that a correct understanding of the original language is going to enable you to correctly interpret the “Word” of God? No! A correct understanding of the Greek and Hebrew did not enable the Jewish leaders to correctly understand Christ. Who was it that did understand Christ most? It was the common people, the laity, those not warped and indoctrinated with false education and higher criticism – and we are repeating their history. “It has been demonstrated that man by searching cannot find out God. The most learned men in the days of Christ--philosophers, legislators, priests, in all their pride and superiority--could not interpret God's character. They could not discern spiritual things. The ancient pages of the oracles of the gods were turned over and over again, but did not give the wise men any help in solving the problem. When, in the fullness of time, Christ came to our world, it was darkened and marred by the curse of apostasy and spiritual wickedness. The Jews had wrapped themselves about with the dark mantle of unbelief. They kept not the commandments of God, but regarded as of more importance their own traditions. "In vain do they worship Me," the Saviour declared, "teaching for doctrines the commandments of men. For laying aside the commandment of God, ye hold the tradition of men, as the washing of pots and cups: and may other such like things ye do. . . . Full well ye reject the commandment of God, that ye may keep your own tradition." And at another time He said, "Ye do err, not knowing the Scriptures, nor the power of God." These are actual arguments that I have personally heard from ministers and professors of our SDA colleges. And what was it that sister White just said? “the priests and the instructors of the people could not discern that He was their Saviour, nor could they understand the manner of His coming. Unaccustomed to accept God's Word exactly as it reads, or to allow it to be its own interpreter, they read it in the light of their maxims and traditions. “There was a priesthood, the duties of whose members were to reveal the will of the gods. The sacred feasts of Jehovah's people were replaced by the national games of the Greeks. As the passover and the feast of tabernacles called the Hebrew race together, and promoted unity and a love of God, so the Greek games gathered that people together, promoting one common language, religion, and law. God's people met for spiritual worship; the Greeks for physical or intellectual enjoyment. The history of Greece is the history of physical and intellectual culture. The people admired grace and beauty, and her literary minds worshiped the intellect. Plato, the greatest of Greek philosophers, lived four hundred years before Christ, and his teachings have led the thoughts of writers in every age since then. The Jews mingled the teachings of the Bible with the philosophy of Plato, and that formed the traditions of men, against which Christ so often warned his followers. The false philosophy, and the "science falsely so called" of Paul's time, was Greek teaching, which breathed the spirit of Plato and his students. Plato's writings have replaced the Bible with many, and a large number of modern writers, both of prose and poetry, recognize him as their intellectual leader. The philosophy of this man was often good, and he admired truth; but the error lay in admiring or assenting to truth, and failing to live it out. His followers came under the condemnation of Christ, together with the Pharisees, of whom he said, "They say, but do not." Ever heard of the word “Exegesis?” That word comes from Greek philosophy. How about the word “hermeneutics.” That word comes from Greek philosophy. it is derived from the Greek god Hermes – the interpreter and mediator between the Greek gods and mankind. He is a counterfeit of Christ and the Holy Spirit! This is all part of that “mingling” of truth with the false philosophy of the Greeks. There is also yet another attack on the “Word” that is running rampant in today’s modern society. The devil was successful for over 1000 years, in keeping the Bible out of the hands of the people. This time of ignorance was known in history as the “Dark Ages”. During this time, the papal church made it illegal for anyone (other than the priests and prelates of Rome) to have a Bible. Bibles were burned, and if you were found to be in possession of a Bible, or even of reading a Bible, you could be sentenced to death. It was commonly taught that the scriptures were written in a tongue that nobody but the priests could understand. The majority of the common people were so ignorant that most could not even read. Those who could read, had to be careful that they were not discovered or they could be burned at the stake. As the reformation spread, Rome began to lose the power and control that she had exercised over the people. This finally culminated with the “deadly wound” in 1798 when the pope was taken prisoner by Napoleon’s general Berthier. With the invention of the printing press and the loss of power by the papal church, Bibles began to multiply and spread – first throughout Europe and then to the rest of the world. This development threw a monkey wrench into the devil’s plans. Now that the Bible was circulating to everyone, he could no longer keep people “in the dark”, so to speak, about the truth of God’s Word. Since he could not prevent people from reading the Bible, he set about to counterfeit it with a flood of his own corrupted versions. After all, the next best thing to keeping people ignorant about truth is to teach them error. Now I am not going to discuss all the details of the different manuscripts that the Bible is translated from. There are plenty of excellent presentations discussing all the details of each manuscript (such as Professor Walter Veith’s “Battle of the Bibles” and “Changing the Word”. I am basically only summarizing this topic. If you look at the different manuscripts, there are basically only three lines of them. You have the Byzantine text, the Alexandrian text, and Western text. However, the majority of the Western text is like the Alexandrian text, so there are really only two main lines – the Byzantine and the Alexandrian. To make a long story short – the text that was the support and drive for the Protestant Reformation was the Byzantine text. This is the text that later produced the Authorized King James Bible. The Alexandrian text (as the name suggests) came from Alexandria and was a corrupted text that mixed the truth of the Bible with Greek philosophy and higher criticism. All the modern versions have their basis in the Alexandrian text. In fact, the majority of all the versions different from the King James Version have all originated in just the last 60 years. Now in light of the idea that the Bible is the “Word” of God – Christ Jesus, exactly what do you have when you have many versions – all claiming to be “the Word” – but yet all differing on main points of doctrine and none agreeing on what is truth? The term for this would be – Counterfeits! Now obviously, the primary meaning of this text is talking about people who are claiming to be Christ or another Messiah figure. But I believe that there is a secondary meaning or application that we sometimes fail to realize. Remember the quote that we read earlier – It is IMPOSSIBLE for any human mind to exhaust one truth of the Bible!? If you have one “True Word” and many other versions claiming to be the “True Word” – but they don’t match the “True” one – might that be a form of anti-Christ (against Christ)?! So let’s look at this claim – that it doesn’t matter which version you use. So, obviously, God does not change or counteract His own Word. Let’s compare a few texts and see just what the difference is. ESV “He answered and said, "But I see four men unbound, walking in the midst of the fire, and they are not hurt; and the appearance of the fourth is like a son of the gods." Do you see a problem? Notice that the KJV teaches that the 4th man in the furnace was Jesus Christ – THE Son of GOD! But the modern corrupted versions teach that the 4th man was just one of the many sons of PAGAN gods! Does this sound like something that an unchangeable God would say? Notice that the KJV teaches that the fires of hell are not burning right now, and that the wicked will be destroyed on that final day of judgment. But the modern versions teach the Papal doctrine of an eternally burning hellfire – the doctrine that portrays God as mean and vengeful – the doctrine that they developed and used to sell their blasphemous indulgences during the Dark Ages. Notice that the KJV teaches that we are to “study” – that involves Bible study and prayer, and that we are to divide the Word in the right way – this references back to Isaiah 28:10 (precept upon precept, line upon line) This is the Prooftext method of study. But the modern versions teach that it is a “works” oriented religion, and that the historical-grammatical method of study is the way to go. Notice that the KJV shows that the seventh day is “THE” Sabbath. It is the sign between God and His people. It is the seal, the symbol of our allegiance to the Creator. But the modern versions change just one little article – one word, and they change the meaning! The seventh day is no longer “the” Sabbath – it is just one of the many ceremonial sabbaths that finds its fulfillment at the cross. Now I just used some of the modern versions for this example – they all follow the same lines – but I chose these particular versions because they are especially ones that I personally know of that are being promoted and pushed in our SDA churches today! Still another deceptive argument used against the “Word” is that the KJV was written a long time ago, those words are “old” and “archaic” and we don’t understand them anymore. Have you heard this argument? This argument would almost be laughable if it wasn’t so sad that many people actually believe this. KJV: Song of Solomon 4:7 Thou art all fair, my love; there is no spot in thee. THOU, pron. in the obj. thee. The second personal pronoun, in the singular number; the pronoun which is used in addressing persons in the solemn style. Art thou he that should come? Matt. 11. I will fear no evil, for thou art with me. Psalm 23. Thou is used only in the solemn style, unless in very familiar language, and by the Quakers. Now I'm not promoting Shakespeare - there is a lot of bad stuff in his works. What I am saying is that people like to claim the KJV is old and archaic, but they don't have any problem teaching their children Shakespeare - and it uses the exact same type of "old" "archaic" language! Notice also, that Webster says "Thou" is used in addressing persons in the solemn style. I will point out this significance in a moment. How many of you have heard of the Flesch-Kincaid readability scale formulas? This method of testing is used extensively throughout the field of education! If you run the text of the KJV through the internationally recognized industry standard Flesch-Kincaid readability scale formulas, and compare the results with the results of the different modern versions, this “archaic” argument collapses. Using these formulas, reveals that the KJV reads at the 5th grade level, while the NKJV reads at the 6th grade level, the TEV reads at the 7th grade level, the NIV reads at the 8th grade level (“People” magazine), and the ESV reads at the 9th grade level (USA Today). ESV “So Pilate entered his headquarters again and called Jesus and said to him, "Are you the King of the Jews?" Notice that the KJV specifically states their location "judgment hall". Notice also that Pilate, even though he is eventually going to reject the Holy Spirit and turn Christ over to be crucified - when he addresses Christ, there is a level of respect there - "Art THOU..." Here is that solemn style spoken of earlier. But in the modern, corrupted ESV, that level of respect is gone - "Are you..." - and so is the location. Now they are at the "headquarters," which could be anywhere (palace, town square, senate room, Pilate's bedroom, etc." And the NKJV (which is supposedly so much easier to read) says "Praetorium"! Now could someone please show me a child who knows what in the world a "Praetorium" is? Does anyone here, know what a "Praetorium" is? No? Well, don't feel to bad, I don't know either! The KJV is the only Bible that progressively builds in understanding from Genesis to Revelation. There are actually people who have begun reading in Genesis with just a 2nd or 3rd grade reading level and by the time they finished Revelation they were reading at a college reading level. None of the modern versions have that ability! There are about 1 million words in the English language. The KJV uses less than an 8000 word vocabulary. A child knows about 300 words by the age of two, about 3000 words by the age of three, and could easily know the 8000 word vocabulary of the Bible by the age of five. Whether that child knows words like “Coca-Cola” or “consecration” is all the decision of the parents. Do you realize that once we learn something, that thought is always associated with that word? 99% of the people polled responded with "O" - WHY! Why do we know about an emerald city with a yellow brick road and a WIZARD who, according to the scriptures, God considers an abomination, but yet we don’t seem to remember about the home of Job who, was a perfect and upright man? Why do we automatically think of a fictional movie that is a counterfeit of heaven, but we don’t think of the Word of God? Let me give you another example, what is the very first thought that runs through your mind if you hear the phrase “In the beginning”? Now someone who has been raised on the Bible immediately thinks of Genesis 1:1 (Creation, and the Creator). But someone who has been raised in the world, watching TV, will immediately think of a certain science fiction movie (which is a counterfeit of the galactic war we know as the Great Controversy!) What you learned first will always direct your thoughts when it is triggered. In other words, if your first exposure to the phrase “In the Beginning” was Genesis 1:1, then ever after, when you see or hear that phrase – your immediate thought is of the Creator and the work of creation. But if your first exposure was the TV movie, when you later read the creation account in Genesis – your first though, even if it is just a subconscious thought will be of space war, aliens, and battleships. AT Jones tells the story of an English statesman that died at a very old age. As he was dying, he kept repeating the Lord’s Prayer in French. This caused everyone to ask questions, because, being an Englishman, he didn’t speak French. Inquiries revealed that when he was a young child, his caregiver was a French nurse who also happened to be a Christian. She had taught him the Lord’s Prayer in her native tongue – and since that was the first memories that he had – they were the last memories that he had! Another point to make is that the modern versions leave out much of God’s Word. The ESV for example, removes or leaves out more than 33,000 words in just the New Testament alone. That is the equivalent of completely removing the books of Joel, Obadiah, Jonah, Nahum, Habakkuk, Zephaniah, Haggai, Malachi, Philippians, Colossians, 1 Thessalonians, 2 Thessalonians, 1 Timothy, 2 Timothy, Titus, Philemon, James, 1 Peter, 2 Peter, 1 John, 2 John, 3 John, and Jude – Combined! What is the warning that Rev. 22:19 gives? “And if any man shall take away from the words of the book of this prophecy, God shall take away his part out of the book of life, and out of the holy city, and from the things which are written in this book. And still another point, Did you know that the King James Bible has its own built in dictionary? Let me give you an example. Let’s say you want to know what an “adder” is? That might be a difficult word if you don’t know what it is. “Dan shall be a serpent by the way, an adder in the path, that biteth the horse heels, so that his rider shall fall backward. Did you notice that the verse defined the word itself? An Adder is a Serpent. “Burning lips and a wicked heart are like a potsherd covered with silver dross. Look at the surrounding texts. What words do you see? Dissembleth means “cover” “deceit” – to cover and hide something with deceit. The modern corrupted versions lose most of this built in dictionary feature! I’ve just given some of the many examples that could be given refuting the different attacks on the Word of God today! We claim to be followers of Christ – the Word. But by our lives, do we show it? Or do we, by our words, our actions, our beliefs, our education, and our character – in essence make the claim that Jesus Christ -the Word - is faulty, is uninspired, is impossible to understand, or is old and archaic? Do we cherish the Word as the treasure that He is? Or do we – in the name of higher education - reject and crucify the Word on the intellectual cross of scholastic theology!? Are the scriptures, to us, just pages with words on them, or are they the Eternal Word of God that opens up to our understanding, as a boundless shoreless sea? When we open the Bible, do we treat Him as any other old history book, or do we treat the Word with the awe and the respect that He is due? The Word – Jesus Christ!